It was mentioned in the Avengers thread but Joss Whedon's Marvel TV series is revealed as S.H.I.E.L.D. Last edited by KaizokuJinbei; January 10th, 2015 at 11:34 AM. But what would a S.H.E.I.L.D. series be without Agent Coulson? It just doesn't seem right. interview with whedon related to the new shield series but not revealing anything new, mostly comments on why he took the marvel contract. Skye: This late-20s woman sounds like a dream: fun, smart, caring and confident – with an ability to get the upper hand by using her wit and charm. Agent Grant Ward: Quite the physical specimen and “cool under fire,” he sometimes botches interpersonal relations. He’s a quiet one with a bit of a temper, but he’s the kind of guy that grows on you. Agent Althea Rice: Also known as “The Calvary,” this hard-core soldier has crazy skills when it comes to weapons and being a pilot. But her experiences have left her very quiet and a little damaged. Agent Leo Fitz and Agent Jemma Simmons: These two came through training together and still choose to spend most of their time in each other’s company. Their sibling-like relationship is reinforced by their shared nerd tendencies – she deals with biology and chemistry, he’s a whiz at the technical side of weaponry. Clark Gregg as Agent Coulson is the first confirmed cast member for this show. Because Marvel is creatively bankrupt and Jeph Loeb ruins everything. Good news for my ears tho, especially due to my crappy day on DC's end. It could be a show set in the past! In Iron Man, he said it wasn't his first rodeo, and Fury in Iron Man 2 said Tony wasn't the first superhero. I always thought he was referring to Captain America. Yeah, I guess. But why would Fury need to tell Tony that? As if he doesn't know who Cap is! Nice to see it confirmed. I never got the impression in the avengers that he was definitely dead. But maybe I'm still wrong and the series plays prior to those events and after season 1 the coulson torch gets passed and season 2 plays after the avengers movie. It's kinda like One Piece. Unless we see a truly dead body that isn't immediately taken off the battlefield, it's not a true death. Easily ressurected. 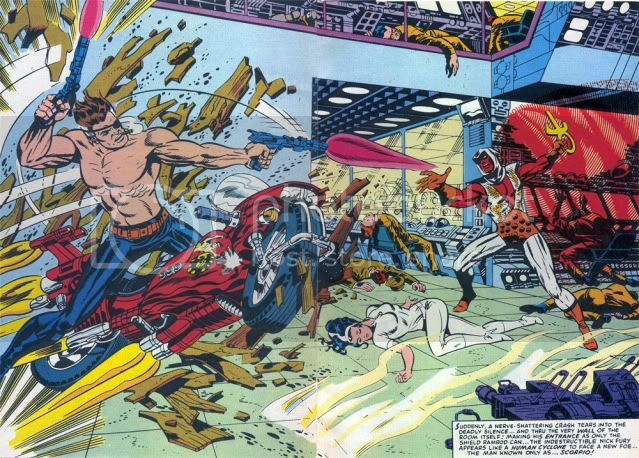 I', getting the feeling that this series is going to be pre-Avengers, and that's why he's back. After all, we really don't know anything about SHIELD in the cinematic universe. 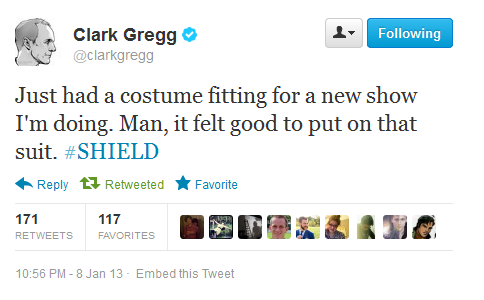 I think it's more that Clark Gregg really pushes for more work at Marvel. I think he got a little too cosy. But nevertheless I do love Coulson, this series will be fun. Original Street Fighter movie's Chun-Li, Ming-Na Wen (whose many other credits include Mulan and Stargate Universe), will be playing one of the lead roles: Melinda May.